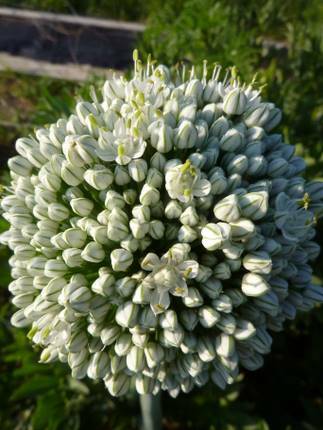 Copra onion blossom: this F1 original seed, purchased/planted in 2007, is five generations removed from its hybrid origin. Does this make it a non-hybrid yet? It is a great yellow storage onion nonetheless for me. With all the green pressure of seeding, growing and harvesting one’s own edibles, I will tell you it makes sense to go a step further. You should harvest your own seed. My first true (read: overwhelming) harvests of 2012 happen concurrently with the first harvests of next year’s seeds. I allow, intentionally most of the time, lots of my spring veg to go to seed. Many are biennials and thus won’t seed until this, their second, spring, but most are simply live-and-die annuals hellbent on reproduction in this, their only, year of life. So I keep a store of paper lunch sacks handy and I snip off dried seedheads, marking the bags with a permanent marker as to what the heck they are, then I fold these bags to store in the basement for next (or maybe later this) year. Roots, lettuce, brassicas, spinach, alliums, herbs. Who needs a seed store when you have your own store? The above is an example of inadvertent seed saving and seed starting. About a month ago I deadheaded some Russian kale (the red, toothy kind) and left the seedpod branches on the ground to pick up later. Well, it looks like I have my fall kale started already! whoops. Also, the ridiculously hot temperatures have lifted (joy) but one of the casualties was the artichokes. The very thought of steaming them steamed me, so I let them flower. 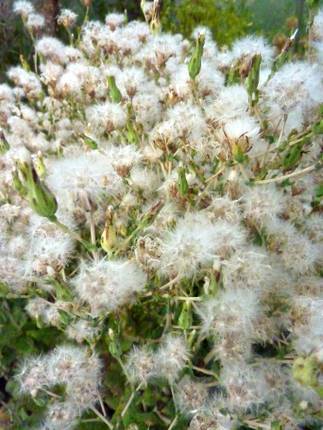 Beautiful relative of the thistle, huh? My go-to guide for all seed saving adventures is Seed to Seed by Suzanne Ashworth, et.al. There are other guides out there I am sure but this one is handily grouped by plant families and has relevant information about a plant’s suitability for growth in your particular area of the US. If you know of others, please leave them in the comments. Happy harvests! I always feel very self-reliant when I save seed, but so many varieties require more isolation than I can give. I concentrate on the things I know are easy, such as beans and some herbs. 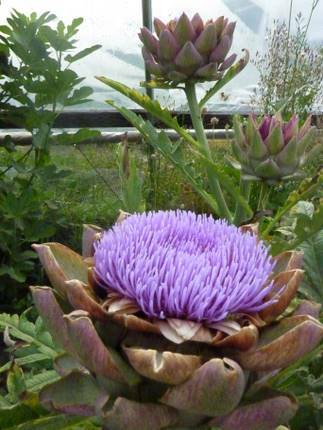 Lovely idea, and those thistle-artichokes are almost neon in their luminosity. thanks for the book reccomendation! i’ve used the Seed Starter’s Handbook with good results, but it’s not particularly climate-sensitive (and i’m in the desert southwest, which is a very particular sort of climate) and I am always interested in more resources. Have been branching into seed saving too, mostly due to a few gorgeous lettuce plants that I couldn’t bear to eat, so they became my guinea pigs. We let some mustard go too, thinking we’d use the seeds for culinary purposes, but the yield way way low, ha. Oh well, we can plant it! Thanks for the paper bag tip, I have been putting of the chore as I don’t want to deal with processing the seeds, but realize now I can postpone, Excellent! In the summer madness over here with only a short time at a decent ‘pooter each week, I want you to know that your blog is one of the few I read the RSS feed of, rather than dismissing cos I’m too busy. been blogging again and was catching up on my favorite reads. i always enjoy seeing what you are up to! your place looks just great. hope you and your are well. 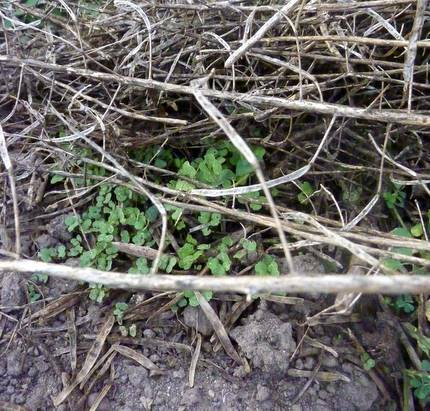 We didn’t till any of our soil from last year and it was amazing how many plants came back of their own accord and how vigorous they were! One of the coolest looking ones was a corn cob that some how got forgotten and sprouted all these little corn plants right beside each other. Wish I had taken a photo. Self-seeded sunflowers, calendula and anise hyssops were out of control though! This spring we transplanted tons of their seedlings to different areas but even still, they all but took over our garden in certain parts as I didn’t have the heart to pull them out as though they were weeds.